Red-breasted Sapsucker – the word caught my eye as I started checking L.A. County Birds sightings reports a week before I left for California. It continued to be seen at Veteran’s Park, in the NE corner of San Fernando Valley, an easy drive from Encino where I would be visiting. 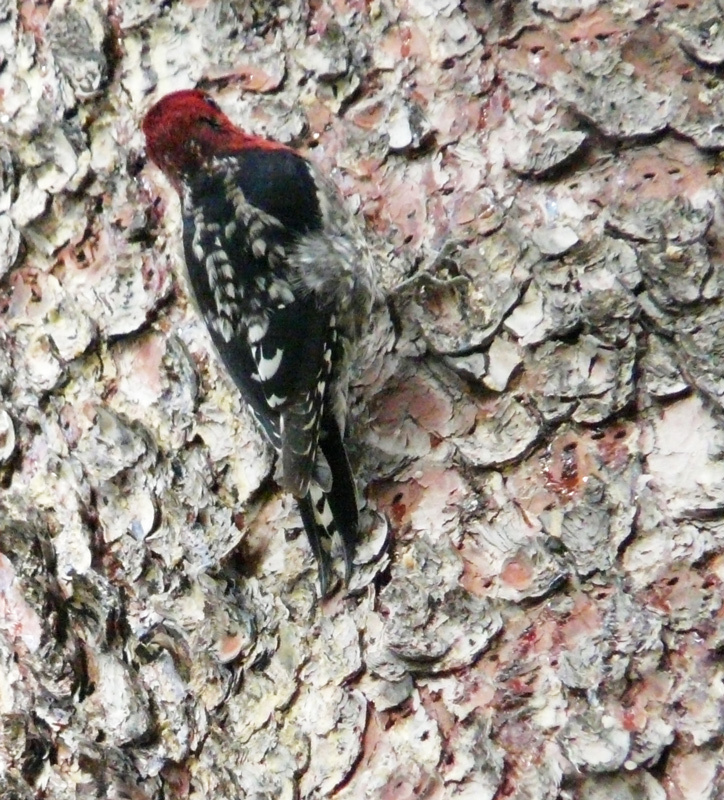 The Red-breasted Sapsucker was one of the birds on my Southern California wish list. It was being seen with a Yellow-bellied and a Williamson’s Sapsucker. It was the Williamson’s that L.A. county birders were most excited about. While I see the Williamson’s regularly in the mountains of New Mexico, the Red-breasted would be new for me. Strictly a coastal species, it migrates from the mountain ranges of Washington, Oregon and California to the lowlands during the winter. Once in the park, I followed the road to a parking area where I saw walkers ambling down a slight hill. The lamp post at the beginning of the path was #40. It seemed like it would be a long walk to reach #20. When I arrived at the next pole, it was #39, so figured I must be walking in the right direction. I heard tapping at the edge of a nearby ravine – a Hairy Woodpecker. The lam posts and path seemed to end at #32 – hmmm. I noticed another path and more lamp posts below, so headed down the grassy hill – and found myself right at lamp post #20! There were two species of pines. Were the sapsuckers in the long-needle pines along the path or in the shorter-needle pines clustered between the path and the playground? I checked out the ones bordering the path and found a small set of sap wells, but no sapsuckers. While I was waiting for their return, I wandered over to the edge of the park where a California Towhee was working the edges of a ticket and a Ruby-crowned Kinglet buzzed in the bushes. A tsick-a-dee-dee call alerted me to an Oak Titmouse – always fun to see. An Allen’s Hummingbird was performing U-shaped display flights between two small trees. When I turned back towards the pine trees, I noticed another birder and walked over to confer with him. He thought perhaps we should check out the other pines, since the bark resembled what he remembered from a friend’s photo of one of the sapsuckers. He had driven from San Pedro to see them. We searched the trees, but no sign of sapsuckers. As he walked back to the path, a male Williamson’s flew in and then worked its way around the back. When I circled the tree, the Yellow-bellied landed on the trunk. I caught the San Pedro birder’s attention and beckoned him over. He arrived in time to watch the Williamson’s fly to a nearby tree, light briefly in plain view, and then zoom off again. The Yellow-bellied had disappeared. “Now you need to find the Red-breasted for me,” I laughed. We heard a steady drilling noise in a clump of pines a short distance away, so walked in that direction. All of a sudden, I caught a glimpse of a bobbing red head, half-hidden behind some lower limbs. I took a couple of steps closer and checked it through by bins. Its bright red head and breast were amazing. I kept inching closer. It continued to drill and seemed unperturbed by our presence and by the clicking of our cameras. As I walked along the path to the parking lot, Western Bluebirds danced on and off the trees and Oregon Juncos, Yellow-rumped Warblers and a few Chipping Sparrows scrounged in the grass. Lesser Goldfinches bleated from the tops of some bare branches. It had been a wonderful morning of birding – and ABA life bird #496.